This card uses a paper pack called Key to my Heart which is now retired but I love that Tulip, Sorbet and Creme Brulee color mix! Very romantic when you add some lacy ribbon and pearls... The large heart was traced onto Tulip cardstock using the negative space from our Hearts Dimensional elements. After I cut it out I stamped it in Tulip using the word block in our Noted Backgrounds stamp set - a new one I'm really enjoying! The paper rose was hand made and the leaves simply freehand cut. I think my favorite thing on this card is that lovely sentiment stamped in Tulip on Creme Brulee - it looks so old fashioned! 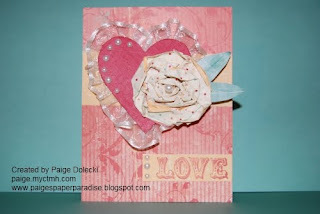 This is a very pretty card, Paige! I love the paper flower! I haven't been brave enough to try one yet, but I may have to. I love the ruffles behind the heart! Beautiful card!